Maybe you thought you were dreaming, but this title isn’t a figment of loopy dreams from too many sleeping pills. As of Friday morning, the Oilers and Canucks shared top spot in the league thanks to their torrid and somewhat surprising starts. The Oilers boast a 4-1 record after defeating the St. Louis Blues on Thursday night. The only blemish on their record occurred during a 6-2 drubbing at the hands of the Buffalo Sabres. When you roster one of the best young players the game has ever seen, maybe it’s not a huge surprise the Oilers jumped out to a hot start. The Canucks on the other hand, have taken everybody by surprise by winning their first four games of the season. The Canucks won their first three coming from behind, something which isn’t sustainable. However, it was such an oddity to see the Canucks claw their way back into games last season that their early season tenacity is inspiring. Maybe neither team has faced stiff competition yet, aside from St. Louis. The Canucks and Oilers have shared the same opponents, with Edmonton playing one extra game versus Calgary. However, would you really say the Oilers and Canucks had a distinct advantage over the Flames, Sabres, or Hurricanes in any of those games? Both teams are getting it done early, albeit with very different styles of play. In a nutshell? Connor McDavid. Okay, so it’s the offence that’s fuelling the Oilers’ early-season success, but the focal point of that offence is McDavid. Even though the 19-year-old phenom went (gasp) pointless in two straight games, he’s still third overall in the NHL with eight points in nine games. Before the season, everyone believed he had a solid chance of winning the Art Ross Trophy. McDavid has done nothing to devalue those notions yet. Although you could probably put Jason Strudwick and Zack Stortini on a line with McDavid and have them score 40 goals a piece, you must give credit to his linemates who are also off to a good start. Jordan Eberle has been especially impressive, with six points in his first five games. 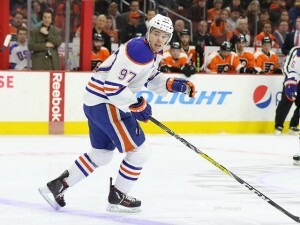 McDavid’s play overshadows another extremely talented young centre who is fuelling the offence. Leon Draisaitl wants to prove that he didn’t just produce because of Taylor Hall last year. He’s off to a hot start with six points in his first five games. The three aforementioned Oilers are all in the top 15 in NHL scoring. Depth option Tyler Pitlick has also been a pleasant surprise. While he won’t sustain his 0.6 goals per game average, contributing three goals in five games has helped him solidify a spot in the bottom-six. Defence remains an issue for the Oilers, who do have one of the worst Corsi percentages in hockey at 46.4%. Despite the fact that they are losing the shot differential battle, they actually have one of the best scoring chance differentials at 57.5%. Although they are allowing a lot of shots, they seem to be limiting the Grade A scoring chances. Cam Talbot and Jonas Gustafsson have given the Oilers average goaltending so far, which might be all they need with an offence this potent. In a nutshell? Brandon Sutter. Maybe we’re giving “Mr. Clutch” too much credit, although his emphatic return to the lineup proves how much the Canucks missed him for the bulk of last season. He leads the team with four points along with 15 shots. However, the main reason behind the Canucks’ success is because of their defence and goaltending. Willie Desjardins has the team playing to their strengths, which lies in a strong neutral zone forecheck while limiting scoring opportunities. They might not be as fun to watch as the Oilers, but they also don’t boast the same offensive talent. The Canucks’ four victories have come in the form of 2-1 (SO), 4-3 (OT), 2-1 (OT), 2-1; three Canucks games have ended at 2-1, and don’t be surprised if that’s how many of their games finish this season. After allowing an inordinate amount of scoring chances last year, the Canucks defence has really tightened up through the first four games. They have allowed the least amount of shot attempts (43.14) per 60 minutes of hockey. On top of that, their goaltending so far has been phenomenal. They have the league’s fifth-best save percentage through four games. Ryan Miller hasn’t allowed a goal in his only start. 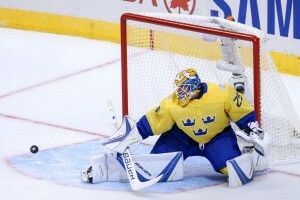 Jacob Markstrom is ranked third overall in goals against average and fifth overall in save percentage. These teams are playing to their strengths, but there are signs that their strong starts will not be sustainable. The Oilers are still giving up too many shots and chances. All of their top four defencemen have a Corsi percentage below 46%. It’s still early in the season to get a good read on how Oscar Klefbom and Adam Larsson will perform together, but they will have to step it up a notch if they want to be a legitimate 1-2 pairing. On the bright side, the Oilers probably played their best game of the season against the St. Louis Blues on Thursday night. If they can tighten things up on defence, they will be a legitimate threat in the Western Conference. The Canucks know they cannot trail heading into the third period and expect to win the majority of their games. They will have to find some early offensive production in order to play with the lead more often. Like the Oilers, the Canucks took a step in the right direction by playing with the lead for the first time this season against Buffalo. They will need to do more of that if they want to complement their stifling style of defensive hockey. The terrific starts, from two of last season’s laughingstocks, sets the stage for a great game on October 28 when the two teams meet for the first time this regular season at Rogers Arena in Vancouver.